Confucius (551–479 BC), or Kong Zi, was a Chinese political figure，philosopher and educator of the Spring and Autumn Period (770-476 BC). He was also the founder of the Confucianism（Ru School）and one of the most well-known cultural celebrities throughout the world. 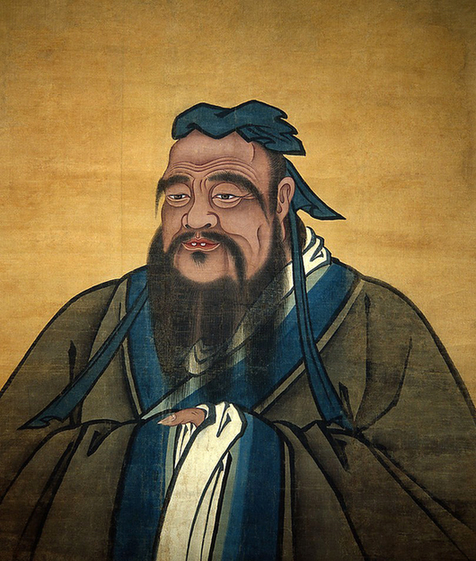 Confucius' surname is Kong, his given name Qiu, and his social name Zhongni. He lived in the State of Lu, somewhere near the present Nanxin town of Qufu city in Southeastern Shandong province. He had edited the court chronicle of Lu State, the Spring and Autumn Annals(Chun-qiu), and his teachings, conversations as well as exchanges with his disciples are recorded in the Analects of Confucius (Lun Yu). The Chinese word translated as gentleman, "Shih", was the term that applied to the lower class of the nobles, the warriors and officials. Confucius added a moral dimension to this term and only used it to apply to people who were worthy moral models. The Chinese word for ritual, "Li" was a term used to describe the elaborate rituals and elaborate manners and customs of Chinese nobles. Confucius broadened this concept to incorporate moral propriety. Living up to demands of "Li" now meant doing more than simply following ceremonies by rote, but also doing them with proper reverence. "Li" can mean "proper conduct" in fullest sense. Dao of Confucianism is a definition of "the way", differing from that of the Taoism. Confucius believed that a virtuous life would bring people into harmony with the "way" or rather, with the cosmic will of an impersonal heaven. 1. "Ren" which is often translated as "benevolence" or "human kindness". It meant being conscientious and altruistic. Humanity or "Ren" is what ties one together with another. It is the practical consideration of one human being for another based on a concept of reciprocity. This concept was not an abstract concept removed from daily life, for "Ren" developed out of fulfilling one's obligations to family and the community. This concept is best signified by what is called the silver rule of Confucianism: "Do not do to others what you do not want them to do to you." 2. "Li", or the rites, were to act as the guidelines for proper conduct. They helped to guide someone who may be unsure of what would be the truly "benevolent" act in certain circumstances. They were described as the "code of formal behaviors for stabilizing and disciplining our ever-changing circumstances". 3. "De, or virtue, is the ultimate goal of Confucian thought. Confucius saw virtue as combining the features of "Li" and "Ren". Virtue for him was concrete and determined by action, not contemplation. A hallmark of Confucius' thought is his emphasis on education and study. Study, for Confucius, meant finding a good teacher and imitating his words and deeds. A good teacher was someone older who was familiar with the ways of the past and the practices of the ancients. While he sometimes warned against excessive reflection and meditation, Confucius' position appears to be a middle course between studying and reflecting on what one has learned. He who learns but does not think is lost. He who thinks but does not learn is in great danger. Confucius is willing to teach anyone, whatever their social standing, as long as they are eager and tireless. He taught his students morality, proper speech, government, and the refined arts. Confucius' pedagogical methods are striking. He never discourses at length on a subject. Instead he poses questions, cites passages from the classics, or uses apt analogies, and waits for his students to arrive at the right answers. Confucius' goal is to create gentlemen who carry themselves with grace, speak correctly, and demonstrate integrity in all things. His strong dislike of the sycophantic “petty men,” whose clever talk and pretentious manner win them an audience, is reflected in numerous Lun Yu (the Analects of Confucius) passages. Moral education is important to Confucius because it is the means by which one can rectify this situation and restore meaning to language and values to society. Confucius did not put into writing the principles of his philosophy; these were handed down only through his disciples, with most collected in the Analects of Confucius (Lun Yu). It made Confucius the model of courtliness and personal decorum for countless generations of Chinese officials.